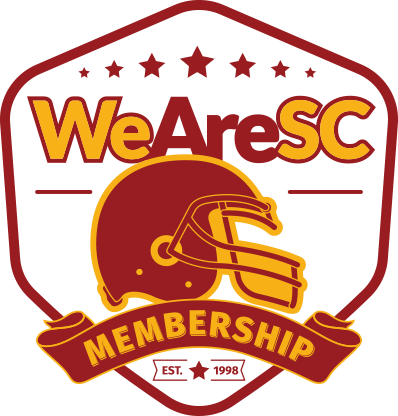 You could have thrown darts at the depth chart and found a position on the field or coaching staff that shared in some of the blame for USC’s 5-7 record last fall. 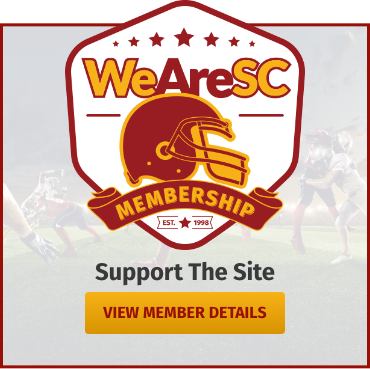 But there might not have been a more scrutinized group than the offensive line, as the Trojans just could never quite get the offense going for four quarters, and struggled in short-yardage situations. And while the arrival of offensive coordinator Graham Harrell’s Air Raid system helps shine the spotlight on a spring quarterback competition and wide receivers who will be asked to raise their productivity from last season, one football adage remains true. “If we handle everything up front, it makes it easier on everybody else,” said left tackle Austin Jackson, one of just two returning starters along the line. Jackson is joined as a returning starter by likely right guard Andrew Vorhees. While left tackle, center, and right tackle are all vacated by departing seniors, the Trojans have been steady so far in trotting out Alijah Vera-Tucker, Brett Neilon, and Jalen McKenzie, respectively, to fill those spots. It’s a family reunion of sorts, as all five of those players were signed in the 2017 recruiting class (McKenzie counted against the 2018 class as a 2017 blueshirt). 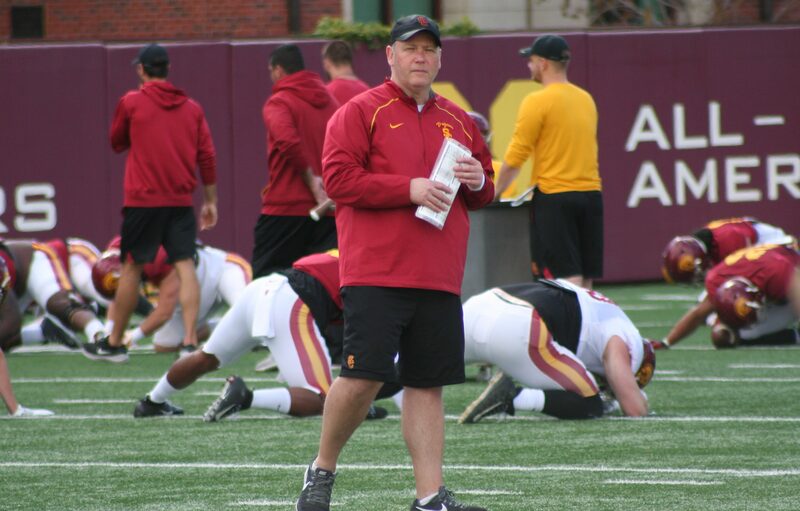 Offensive line coach Tim Drevno is tasked with molding this group into one that can set the tone for what fans hope is a dynamic USC offense. For Drevno, two things stick out when it comes to coaching the offensive line, and football in general. There were questions as to what the offensive line’s responsibilities would be in this air raid system, and Drevno said there have been some adjustments, but probably not as many as some might expect. Jackson also downplayed any kind of massive change in expectations for the offensive line. McKenzie, who saw action at right tackle last in in place of Chuma Edoga, said he’s never been in an offense like Harrell’s, but things clicked quickly for him when it came to grasping the overall. For several offensive linemen, including Jackson, just getting back on the field for spring was a major relief. 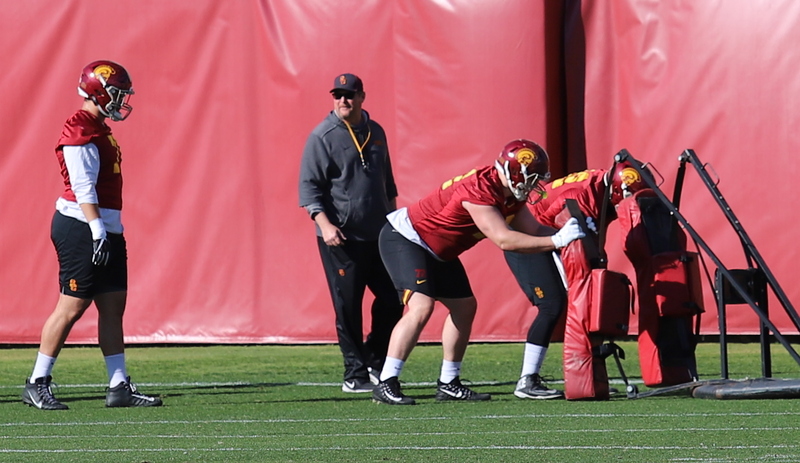 Head coach Clay Helton has praised the offensive linemen for stepping forward during winter conditioning workouts to take on more of a leadership role. Jackson said that wasn’t an accident. “I think as big guys, we took it upon ourselves to be more together as a unit and lead everybody else,” he said. One improvement that is noticeable early on in spring ball is how good the snapping has been, both from Neilon and Justin Dedich. Again, that isn’t by accident. Neilon said the centers are constantly being graded on their snaps, and only the quarterback catching the ball at his chest, center mast, is graded as a perfect snap. Neilon said Drevno has been particularly tough on the centers, adding that he will go into a meeting thinking he hit a certain percentage, only to find out his rate suffered a few more dings than he was expecting. Tuesday’s practice saw the offensive line challenged a bit as the defense began bringing pressure in earnest for the first time this spring. Communication with three new starters will be something to watch as the defense continues to throw new wrinkles at the line, but in an offense built on repetition and one that allows them to still be aggressive in the run game, there is a positive outlook from the projected starters.